Morning fly to Juphal (2550m) and Nepalganj - Juphal (2250m) by plane - Dunai (2150m). 3-hour walk. During the flight, we can enjoy a superb panorama of the Annapurnas, Dhaulagiri and Manaslu. Overnight at camp. The trail goes along the Thulo Bheri river towards Tharakot. This village was an ancient fortress and a caravan stop. Overnight at camp. Day 06: Tharakot - Lahini (3200m) in 5h. Steady ascent by steep trails through fir and juniper forests. Overnight at camp. Day 07: Lahini - Naure Odar (3100m) in 6h. The narrow trail goes through the Tarap Khola gorges. Overnight at camp. Day 08: Naure Odar - Dho (4000m) in 6h. We come out onto the Tibetan plateau. A tough walk gradually-disappearing vegetation, towards Dho, the main village of the valley. Overnight at camp. Day 09: Dho. Acclimatization day. 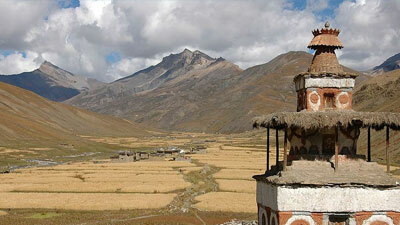 We will visit the three main villages of the Tarap valley and the Ri Bhumpa Gompa and Bon-Po Gompa monasteries. Overnight at camp. Day 10: Dho - Camp at 4100m (before the pass) in 5h. In this region, men trim their hair with red threads and wear them in a chignon like the Khampas from Tibet. Women wear heavy silver headgear. Overnight at camp. Day 11: Camp at 4100m - Nun La Pass (5360m) - Camp at 4200m in 6h. 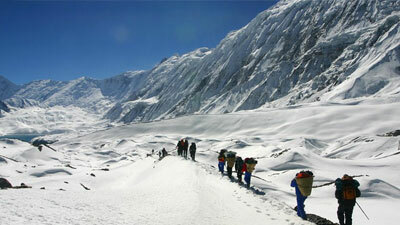 From the Nun La, literraly " salt pass ", the views of the Annapurnas, Dhaulagiri and Nilgiri are superb. 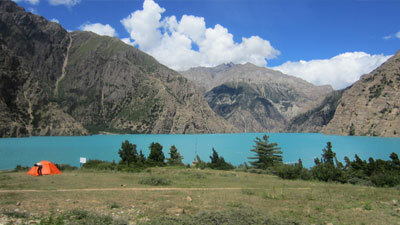 We then descend the other side of the mountain and establish the campsite at 4200m. Overnight at camp. Day 12: Camp at 4200m - Bagla La Pass (5090m) - Roman (3800m) in 5h. The emerald waters of the Phoksondo lake and the picturesque village of Ringmo form one of the most beautiful Himalayan landscapes. Overnight at camp. Day 13: Roman - Ringmo (3510m) in 2h. Gentle walk around the lake and visit the Tesu monastery. 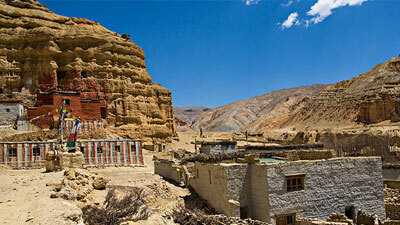 The monastery rules life in Ringmo, a town inhabited by "Bothias ", a tribe originally from Tibet. Overnight at camp. Along the Phoksundo Khola river, the route crosses wooded and verdant areas. The high point of this leg is a spectacular 330m waterfall, the highest one in Nepal. Overnight at camp. The route gets easier. We start with a gentle climb through paddy fields towards the small Karcha La pass and descend through fir tree and rhododendron forests to Tilje. Overnight at camp. Fly to Nepaljung and then Kathmandu. Overnight at hotel. Day 17 : Shopping day at Kathmandu. Overnight at hotel. Day 18 : Drop to the international airport for final departure.